What can you put inside the box that is. Rings and jewelry, love notes and keepsakes, needles and orts. 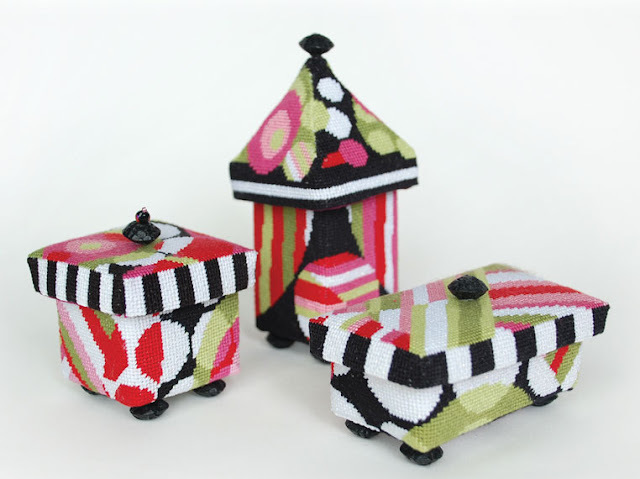 A million tiny wonderful things could hide inside these needlepoint boxes. Three coordinating sizes make a cute display for your stitching table or vanity. The square box has a 2″x 2″ base. Add beads for feet or not. The fit together just like vintage hat boxes. I love the separate lids and bases. Enjoy dreaming what you can put inside to make them uniquely your own.